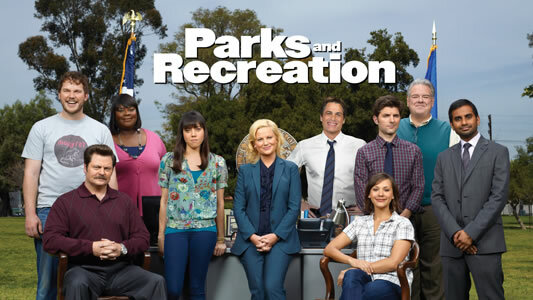 National cable network WGN America has acquired the off-network rights to the NBC comedy Parks and Recreation and will begin airing it this September, 2013. The sitcom has not been cleared for local broadcast syndication and was being pitched for Fall 2014 at NATPE. So the series will likely premiere on cable first in syndication rather than the normal local broadcast five-days-a-week syndication. The comedy has more than enough episodes for syndication but NBCUniversal is likely going more after a SVOD (subscription video-on-demand) play. The series is currently airing in its fifth season and by this fall it will have 90 episodes in the can, which is just enough for syndication and weekday play. The series has not yet been renewed for a sixth season on NBC, but with NBC losing The Office and 30 Rock after this season, it is more than likely Parks will be back. It is unclear how WGN America will schedule the series, but currently WGN America airs comedies 30 Rock, It's Always Sunny in Philadelphia, Rules of Engagement, How I Met Your Mother, Old Christine, Futurama and Scrubs. WGN America will not have exclusive cable rights like usual, as all of those series above can also be found elsewhere. WGN America will share the cable rights for Parks and Recreation with G4, but more on that below (including a name change for G4). From Emmy Award-winning executive producers Greg Daniels (NBC's The Office, King of the Hill) and Michael Schur (NBC's The Office, Saturday Night Live), Parks and Recreation is a hilarious ensemble comedy that follows Leslie Knope (Emmy nominee Poehler, NBC's Saturday Night Live) a mid-level bureaucrat in the Parks and Recreation Department of Pawnee, Indiana, and her tireless efforts to make her quintessentially American town just a little bit more fun. The series also stars Adam Scott, Aubrey Plaza, Aziz Ansari, Chris Prat, Jim O'Heir, Nick Offerman, Rashida Jones and Rob Lowe. We haven't talked about this yet, but the G4 network will be rebranding again and this time the new name will be the Esquire Network (yep, like the magazine). And they will also air off-network cable runs of Parks and Recreation this fall. Beginning April 22, 2013, the G4 network will be rebranded the Esquire Network. The network is a strategic partnership between NBCUniversal and Hearst Magazines to create the only television network aimed at the full, multi-faceted lives of today's modern men. Esquire Network will expand on G4's foundation of games, gear and gadgets to reflect the broad range of interests, passions and aspirations that define men today. Appealing to men's intelligence as well as their sense of adventure, Esquire Network's programming will capture the classic voice, impeccable style and unmistakable wit that have come to define Esquire, the original men's magazine and premier authority on contemporary man. Diverse program categories and genres will feature not only gaming and technology, but also entertainment, food, fashion, women, humor, travel, competition, danger and more. The network will feature a blend of unscripted and scripted series, and movies and specials that appeal to today's man. Partnering with the industry's top producers and talent, the Esquire Network team is developing a slate of engaging all-new original series such as Knife Fight, a passionate celebration of food, executive produced by Drew Barrymore, Flower Films and Authentic Entertainment. Hosted by "Top Chef" winner Ilan Hall, Knife Fight is an underground, after-hours cooking competition where talented chefs go head to head in front of a rowdy crowd of celebrities, critics and die-hard foodies. Another original series, The Getaway (working title), is executive produced by Anthony Bourdain and Zero Point Zero and features travel-loving, well known personalities - people deservedly famous for excellence in their fields - who take viewers to their favorite city on the planet, giving the insiders' track on their top spots to eat, drink, shop and hang out. Fan favorite competition series American Ninja Warrior will return for its fifth season, to air this summer on Esquire Network and NBC. Additionally, Esquire Network will complement its slate of original programming with ambitious and witty scripted series that include reruns of NBC's Emmy-nominated comedy, Parks and Recreation, and the critically acclaimed series from STARZ, Party Down, which aired in 2009-10. Additional programming announcements will be made in the coming weeks. We hope we have some more comedies to go along with Parks and Recreation and Party Down. Stay with us!